The most common cockroach and most often seen around the home or work place. An adult cockroach can be approximately 50 mm in length (3 inches) and brown/red in colour with yellow band outlining the area behind their heads. Female cockroaches produce protective capsules for their eggs. Usually each casing will consist of approx. 16 eggs per case. Once this case it produced the cockroach will then deposit the capsule. This takes place in a warm, humid area which creates the perfect environment for development. After the eggs hatch little nymphs emerge from the capsule and their growth is quite rapid. In fact when there are plenty of food sources for the immature cockroach they develop rapidly with in as little as 5 months. When either gender reach adulthood they develop wings and are able to fly. Be vigilant with sealing any cracks n crevices or holes where pipes enter the house. These cockroaches are known to be attracted to food and water sources in and around the home or work place. Common entry points are through open windows and doors that don’t have weather-stripping or are damaged. Another typical way is under the garage door and little cracks and crevices that may be visible or hidden to the naked eye. Once they have discovered an entry point they will congregate around the wet areas in kitchens, laundries, bathrooms even basement and under stairs. In the wild American cockroaches feed on leaves, fungi, wood particles and small insects but indoors they forage in drains under appliances, kitchen, cabinets on the floor, under floor boards where crumbs of food may have dropped or food that may have been left out in the open for extended periods. WHEN ARE YOU MOST LIKELY TO SEE COCKROACHES? 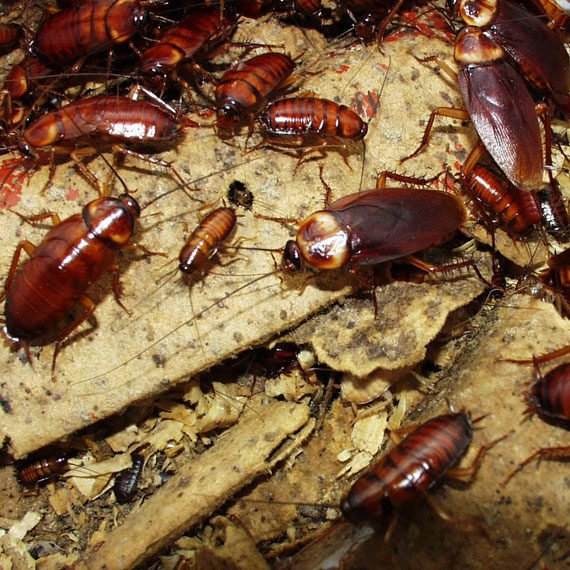 Most Cockroaches will come out at night when there is limited movement and light. If you suddenly switch on a light on you may see them scatter very fast or they may even be startled and try to fly to safety. One would normally see evidence of an infestation of cockroach droppings in moist areas in basement, kitchen cupboards, under appliances and in corners of the kitchen. The cases are about 38 millimetres long they are dark in colour black brown and reddish colours you will normally find the eight cases is bathrooms kitchens laundries cupboards basement in the way under appliances. They hide in dark moist places behind sheds walls in tight spaces, in turn making it hard to find them and only spotting them on occasions. The common cockroach gives off a scent of a chemical called aggression pheromone. This chemical causes the cockroaches to stay together in groups. Some people say the odour is like a musty smell as the population of cockroaches grows the smell becomes much stronger. Here at slug a bug we give you the right information so you can reduce cockroach infestation and this is easily done by removing food sources any water sources around the house making sure Fly screens on windows and doors, weather stripping on the bottom of doors vacuuming regularly ,removing any cupboard lining that may be under pots and plates rubber paper plastic bags ceiling any cracks in crevices where they might enter the house and following this you should have a regular yearly pest spray carried out by your local pest professional. Of course, every home and/or business is different, so we prepare A treatment plan tailored to each individual property. It’s an ongoing process keeping cockroaches out of your house or business it is not a onetime event our technician will assess your home and implement treatment program with ongoing monitoring to keep any infestation under control. After we have inspected the property we will identify any conducive conditions that are attracting pests we urge you have these issues rectified so we can prevent pests from entering your structure in the first place and reduce the amount pests seen throughout the year. seal any holes on the outside of structure holes in brickwork or cladding can be blocked up by using caulking or weather-strips on bottom of doors to block easy access for pests. Make sure your housekeeping is always kept up to date this can also reduce any further infestation/sightings. Make sure screens don’t have holes in them and that you have Fly screens on all entry points doors windows remembering prevention is key. We do gelling in crack and crevice in out of reach places of children. We also apply the insect growth regulator to any places where cockroaches frequent like to hide. This will interfere with their natural development stopping them from reaching adulthood breeding. A residual pesticide is placed around your home forming a barrier around the skirting’s and perimeter of the house so when the cockroaches come out of the hiding spot they will hit the residual insecticide. Here at slug a bug we realise that you have a busy life and can work around your schedule to help make it easier for you. What to expect our general pest treatment comes with a one year service warranty however throughout the year. It is still common see the odd pest that comes in from outside but be assured that they will soon travel over one of the treated areas this resulting in the demise of the pests. With pricing over the phone this sometimes is hard to get accurate without visual inspection when we come out to your property issues may arise that were not discussed or included in the quote. Cover fish tanks & remove pets from inside while treatments are being conducted. Remove all children’s toys & any clothing from the floor. Access to all exposed carpet will allow for a more thorough treatment.